Simon Holden, co-founder of Euroheat, explains how the company’s pre-fabricated biomass solution is helping a Buddhist retreat enjoy a greener future, while making life easier for heating installers. Coddington Court, a Buddhist retreat in Ledbury, Herefordshire, is looking forward to lower energy bills and reduced carbon emissions thanks to a major overhaul of its heating and hot water system, which includes the installation of a pre-fabricated biomass solution. The site has undergone a huge refurbishment project over the last year in order to establish a central resource for the Triratna Buddhist Order and Community. The centre has been transformed to provide accommodation for both the men’s and women’s communities, plus visitors, a library, retreat and study facilities for up to 100 people, as well as extensive gardens. 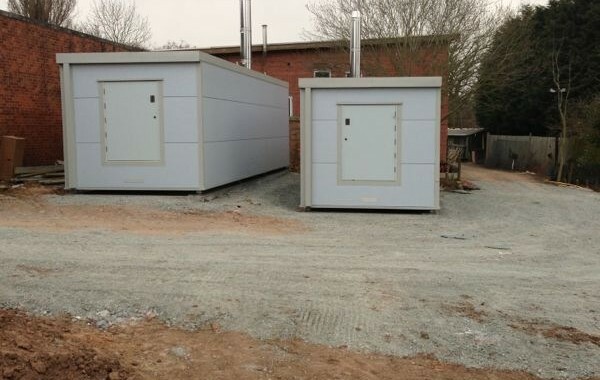 The site’s heating and hot water is now provided by two Euroheat Energy Cabins – biomass heating in a pre-fabricated box. Installed by the Efficient Energy Centre, this was deemed the most suitable solution for both end-users and installers as the cabins arrived on site, ready to plumb-in, wire-up and go, saving a considerable amount of time and cost – up to 30% compared with a traditional system. In some cases, due to the fact that they are considered non-permanent structures, the cabins can also negate planning issues, which is ideal for period buildings, such as Coddington Court. Each cabin houses an HDG Compact 200, 194kW pellet boiler, which qualify for a yearly RHI payment of nearly £22,000. Over the 20 years of the scheme, Coddington Court will earn just under £440,000 per Energy Cabin. Added to this is 3% from the Retail Price Index (RPI) which bumps the figures close to £590,000, so over £1 million – a very healthy return. In addition to the boiler, the cabins also include 4,000 litre accumulators, FRA-PSS pellet feed and TBZ80 vacuum transfer systems. Accumulator’s are an essential element; they store hot water for whenever it is needed, allowing the boiler to work at full capacity – the most efficient way to run a biomass boiler – turning off when the accumulator is full. Energy Cabin’s can be logs, chips or pellets, but for a job of this size logs are not pheasable as these boilers require hand loading. Pellets offer a number of benefits to end users; they take up less storage space, have a minimal ash content and arrive on site in the correct state to burn. Logs and chips must have a moisture content of 25% or less. “Coddington Court will not be fully up and running until August, but so far so good!” Tim continued. “We should have a better idea of the savings we will be making after our first winter here, but we anticipate just a seven to eight year payback period on our initial investment, which is great. “We wanted to make the site as energy efficient as possible, so in addition to biomass technology, we have also installed a wetland system to treat all of the waste water. We have upgraded the existing buildings thermally, adding insulation and replacing existing blown double-glazed panels, as well as minimising all electrical consumption through the use of LED lighting and better specification, low energy electrical goods. “From an installer’s point of view, fitting a pre-fabricated system is much more straight forward. Once the underground pipework’s in place it’s just a case of connecting up the electrics and hot water to the existing heating system – ideal for retrofit applications. The whole process is far quicker than a traditional biomass install – days instead of weeks. Other pre-fabrication benefits include the fact that the heating system comes in its own plant room, meaning out-buildings or a completely new structure do not need to be utilised, another cost saving factor. For public buildings, such as Coddington, the reduced installation time and quick connection to existing heating allows for minimal or no downtime. When there are two Energy Cabins, if maintenance is required, or in the unlikely event of breakdown, one can take over while the other’s out of action, meaning the risk of complete system shut down is vastly reduced.